We provide high quality flooring for basketball courts, indoor tennis courts, roller skating rinks, and more throughout the St. Louis area! Home to the St. Louis Blues (NHL), the St. Louis Cardinals (MLB), and four different NFL teams over the years, St. Louis, MO has a long, rich history shaped by athletes and sports teams. Homecourt Sports is proud to support this legacy by providing the highest quality basketball and indoor tennis courts in St. Louis. 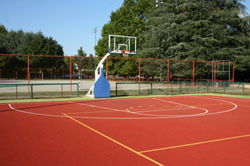 Basketball courts, indoor tennis courts and roller skating rinks throughout St. Louis benefit from having our high-performance, low-impact flooring installed. If you’d like to experience the difference of Homecourt Sports’ custom flooring, call us at (314) 374-303 or 1-866-51-COURT or contact us online today for a FREE design consultation!